Acute eosinophilic pneumonia (AEP) is a cause of acute respiratory failure, and differs from other eosinophilic pneumonias by its acute onset, presence of fever and acute hypoxaemia. Cases of 2009 influenza A (H1N1) virus infection have included rapidly progressive lower respiratory tract disease resulting in respiratory failure. We describe the case of a young patient who showed dyspnoea, fever and rapid radiological progression and was simultaneously diagnosed with AEP and 2009 influenza A (H1N1) infection, which was diagnosed by using bronchoalveolar lavage (BAL). We suggest that 2009 influenza A (H1N1) virus should be considered as a cause of AEP, and BAL can provide further information, especially in patients with severe lower respiratory disease. A 20-year-old man was admitted to a nearby hospital with symptoms including fever (38.3°C), dyspnoea and chest discomfort for 2 days. He had no history of smoking, drug use or exposure to dust and disease, such as allergies or HIV infection. Chest auscultation revealed inspiratory crackles in both lower lung fields. 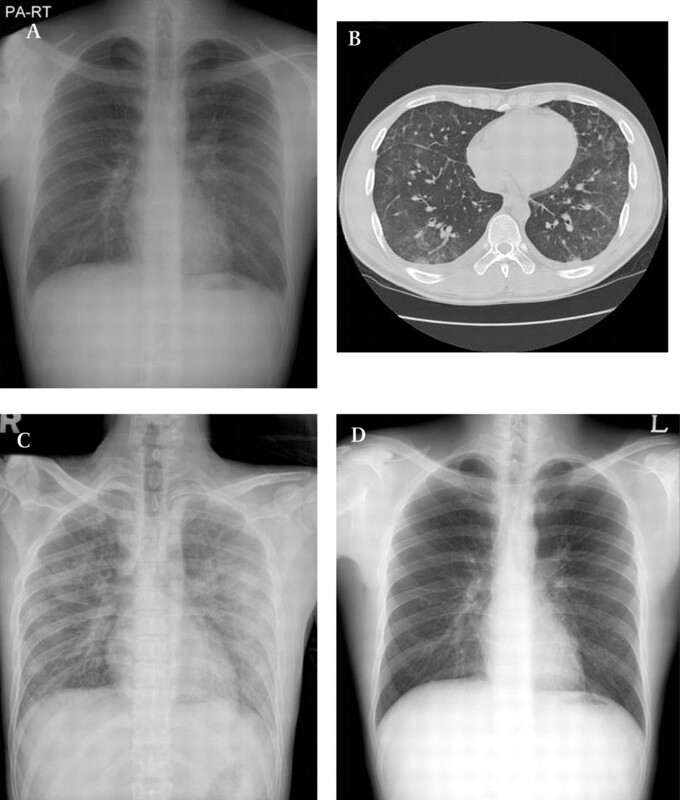 A chest radiograph and CT showed ill-defined ground-glass opacities with interlobular septal thickening and minimal bilateral pleural effusion (figure 1A,B). The patient's arterial blood gas analysis was pH 7.46, PaO2 70 mm Hg, PaCO2 36.2 mm Hg and 95% O2 saturation. The results of other laboratory tests revealed white blood cells 13.0×109/l (neutrophils 73%, lymphocytes 14.2%, monocytes 8.6% and eosinophils 4.2%) and C-reactive protein 7.2 mg/dl. The clinician prescribed oseltamivir (75 mg twice daily) and obtained a throat specimen for real-time reverse transcriptase–PCR (RT–PCR) test for 2009 influenza A (H1N1). On the day following admission, a chest radiograph showed further aggravation (figure 1C). The patient was transferred to our hospital and admitted to an isolation room in the intensive care unit. We performed bedside bronchoalveolar lavage (BAL) that recovered 0.36×109 cells/l with a differential of eosinophils 39%, lymphocytes 29% and polymorphonuclear leucocytes 5% (figure 2). We requested an RT–PCR test for 2009 influenza A (H1N1) using the specimen obtained through BAL. Cultures of blood, urine, sputum and BAL specimens did not show growth of any pathogenic organisms. We tested for allergies (serum total immunoglobulin (Ig) E, MAST allergen inhalant), parasite infection (serum parasite-specific antibody IgG), and conducted an HIV-1 enzyme immunoassay screening test; all the results were within the normal range. On the basis of the acute eosinophilic pneumonia (AEP) criteria, we diagnosed this case as AEP, and prescribed prednisone (30 mg twice daily) in addition to oseltamivir. The 2009 influenza A (H1N1) RT–PCR results were reported on hospital day 2. The test on the upper respiratory tract specimen (throat swab) was negative, but the test for the lower respiratory tract specimen (BAL) was positive. Consequently, 2009 influenza A (H1N1) infection was diagnosed. The patient took oseltamivir (75 mg twice daily) for 5 days and prednisone (30 mg twice daily) for 7 days; prednisone was then tapered off for 7 days. After the patient started taking prednisone, his symptoms improved immediately and fever subsided. A chest radiograph showed complete resolution of the pulmonary lesion (figure 1D). (A) Chest radiograph on admission showed mixed reticular and ground-glass opacity on both mid and lower lung fields with bilateral blunting of the costophrenic angles. (B) Chest CT showed ill-defined ground-glass opacities with interlobular septal thickening and minimal bilateral pleural effusion. (C) Chest radiograph on 1 day after admission showed further aggravation of the pulmonary lesion. (D) Chest radiograph on the day of discharge showed complete resolution of the pulmonary lesion. Centrifuged preparation of the bronchoalveolar lavage (BAL) fluid. Eosinophils accounted for 39% of the total cells (Diff-Quik stain, A: ×200, B: ×400). AEP is an acute febrile respiratory illness with severe hypoxaemia, diffuse pulmonary infiltrates and an increase in BAL eosinophils. One study has suggested that AEP is an acute hypersensitivity reaction to an unidentified inhaled antigen.1 The following observations are consistent with this hypothesis. Onset of cigarette smoking, alterations in smoking habits, unusual outdoor activities and inhalation of cocaine or heroin are the known reported causes.2–6 There is also evidence that some infections can cause AEP. In patients who received lung allografts, AEP was attributed to Aspergillus species, coxsackie A2 virus and Pseudomonas maltophilia.7 In the present case, we tried to exclude known possible causes of AEP. The patient had no history of allergic disease, smoking, drug use or exposure to dust. The tests for allergies, parasite infection, HIV infection and bacterial infection were all negative, and there was no peripheral eosinophilia. Consequently, the only one possible cause of AEP was 2009 influenza A (H1N1). 2009 influenza A (H1N1) virus has emerged to cause the first pandemic of the 21st century, and can cause acute respiratory distress syndrome in previously healthy persons.8 In most cases, 2009 influenza A (H1N1) virus is confirmed by using an RT–PCR test that is performed on a swab obtained from the upper respiratory tract. The performance of RT–PCR assays specific for 2009 influenza A (H1N1) has not been established for BAL and tracheal aspirates. However, the US Centers for Disease Control and Prevention recommends that lower respiratory tract specimens should be collected and tested to improve diagnostic yield in patients with severe lower respiratory disease (eg, suspected viral pneumonia) who are intubated or undergoing bronchoscopy.9 One report has demonstrated that investigators assayed 21 patients who were confirmed as having 2009 influenza A (H1N1) infection. Investigators obtained upper respiratory tract specimens from the nose or throat, and lower respiratory tract specimens using bronchoscopy. Specimens from the lower respiratory tract were positive for 2009 influenza A (H1N1) in all patients when tested with RT–PCR, but specimens from the upper respiratory tract were positive in only 17 of 21 patients (81%).10 In accordance with this previous study, our present case showed that RT-PCR was only positive in the lower respiratory tract specimen. Although the patient in this report received oseltamivir, if a lower respiratory tract specimen had not been obtained we could not have confirmed the cause of acute febrile lower respiratory disease. To our knowledge, this is the first report of AEP associated with 2009 influenza A (H1N1). We conclude that 2009 influenza A (H1N1) virus should be considered as a cause of AEP. Although BAL is not the essential specimen for study in the diagnosis of all patients presenting with suspected 2009 influenza A (H1N1), it can provide further information for clinicians, especially in patients with severe lower respiratory disease.
. Acute eosinophilic pneumonia: a hypersensitivity phenomenon?. Am Rev Respir Dis 1989;139:249–52.
. Early-phase neutrophilia in cigarette smoke-induced acute eosinophilic pneumonia. Intern Med 2003;42:839–45.
. Alterations in smoking habits are associated with acute eosinophilic pneumonia. Chest 2008;133:1174–80.
. Acute eosinophilic pneumonia in a New York city firefighter exposed to World Trade Center dust. Am J Respir Crit Care Med 2002;166:797–800.
. Cocaine-induced fatal acute eosinophilic pneumonia: a case report. WMJ 2007;106:92–5.
. Acute eosinophilic pneumonia in a heroin smoker. Eur Respir J 1993;6:750–2.
. Graft eosinophilia in lung transplantation. Hum Pathol 1992;23:1172–7.
. Pneumonia and respiratory failure from swine-origin influenza a (H1N1) in Mexico. N Engl J Med 2009;361:680–9. United States Centers for Disease Control and Prevention. Interim recommendations for clinical use of influenza diagnostic tests during the 2009–10 influenza season. www.cdc.gov/h1n1flu/guidance/diagnostic_tests.htm (accessed 9 Dec 2009).
. Rapid-test sensitivity for novel swine-origin influenza a (H1N1) virus in humans. N Engl J Med 2009;361:2493.